How Interleaving Improves Data Transmission Systems? How Interleaving Improves Data Transmission Systems error correction blocks interleaved during transmission data transmission corrupted by correction built into and transmitted. 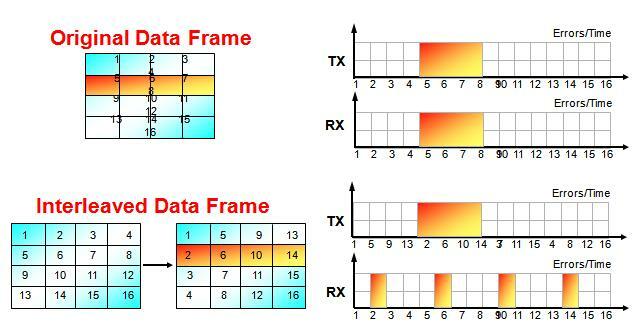 This graphically demonstrates why interleaving data improves error correction performance of data transmission systems. In the top Image, data is sequentially read out of a buffer than goes by rows. No interleaving is employed. The data is read and transmitted in numerical order. During transmission, data blocks 5 through 8 are corrupted by some interference. When the data is received, blocks 5 through 8 are lost and the error correction is insufficient to recover such a large block of lost data. In the lower image, the same data is first interleaved using a simple pattern of reading the rows into columns. The interleaved data is then read out by row and transmitted. During transmission the data in the same four blocks is corrupted by interference. However, the blocks that were lost are no longer sequential. Blocks 2, 6, 10, and 14 were lost. When the interleaved signal is received, the receiver reverses the interleaving process to restore the data to its original sequential pattern. Notice what happens after de-interleaving: the lost blocks are now spread in time resulting in small, isolated error locations. Now the limited error correction built into the signal can correct the errors. Interleaving makes the most use of the error correction built into a data transmission system. « What is CDMA Time Diversity ? » How Power Control in Reverse Link in CDMA ? 26 queries in 0.315 seconds.